A tried and true chicken soup is often a recipe staple that makes appearances during cold and flu season as well as on the holiday table. But if you are feeling a bit tired of this standard recipe, why not explore one of the chicken soup recipes from around the globe? 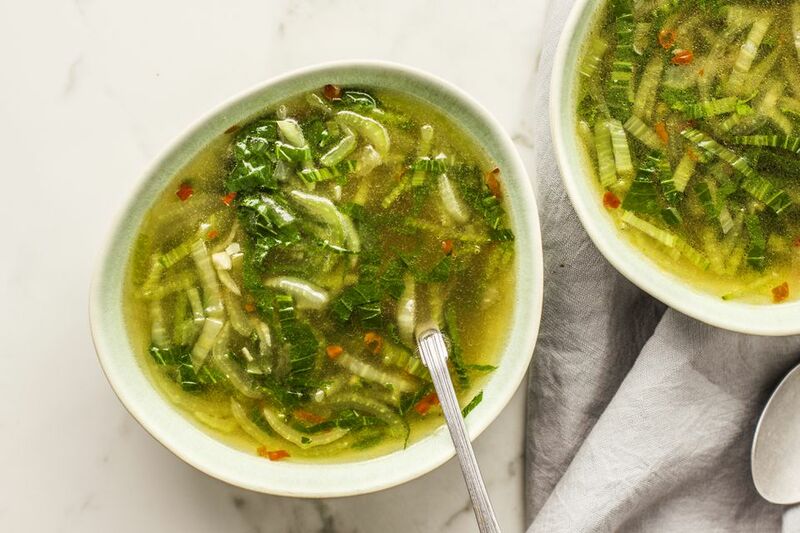 This quick and easy Chinese recipe brings together the quintessential comfort of chicken soup with the ubiquitous flavors of the Far East while pumping up the nutritional benefits with a bit of bok choy. You can use store-bought or homemade chicken broth; using a broth from scratch, or adding cooked chicken or raw, peeled shrimp, will increase the nutrition even more. Bring the chicken broth to a boil in a medium saucepan. Stir in the red pepper flakes, soy sauce, Asian sesame oil, and chopped garlic. Add the bok choy leaves. Simmer for up to 10 minutes, until the bok choy leaves turn dark green and are wilted and tender. If you would like to explore other countries' versions of chicken soup, there are plenty of interesting and flavorful recipes to choose from. A Thai chicken and vegetable soup bring together the flavors of garlic, ginger, lime juice, and coconut milk, making for a rich and comforting soup. The avocado, tomato, and onion in Mexican chicken soup add color and texture while the squeeze of lime juice offers a refreshing finishing touch. And kotosoupa, Greek chicken soup, is somewhat similar to a traditional soup with the addition of potatoes, diced tomatoes, and orzo while the country's popular avgolemono, or Greek egg-lemon chicken soup, uses eggs to thicken the broth and lemon zest to brighten the dish. Sometimes it seems these terms may be used interchangeably, but chicken broth and chicken stock are actually very different. Chicken broth is made from chicken meat while the stock is made from the chicken bones. As a result, the chicken stock has a richer flavor due to the gelatin being released from the bones while they simmer for a long period of time. You don't want to substitute chicken stock for broth in most recipes. For example, chicken soup calls for broth because you don't want the richness of stock to take over. However, if a recipe lists chicken stock and you only have broth, you can add some more flavor by simmering the broth along with vegetables like carrots, onion, celery, leeks, herbs, and garlic.